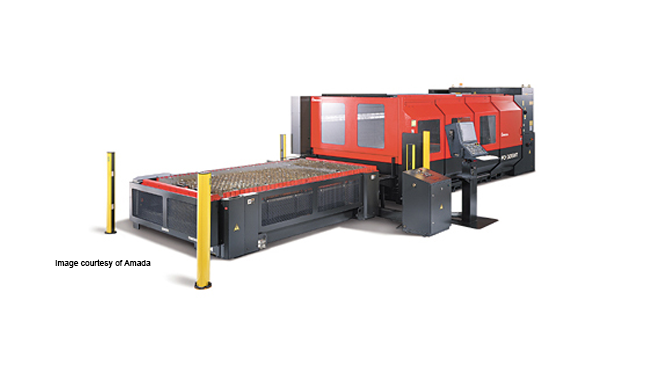 The laser system from Amada's FO series has high acurracy with highspeed processing. CAD/CAM sheet metal software created by Merry Mechanization is a great CAD/CAM system to use on this machine. The RF discharge systems gives the laser oscillator's electrodes a long service life. The laser oscillator's consumption rate of laser gas is lower and the power supply provides great reliability. A stacking device, loading and unloading device, and a lifter table makes up the sheet metal storage shelf unit. The Amada FO 4020 laser machine can load sheet metal material and unload the finished parts automatically. The Amada FO4020 also has a pallet changer. Heavy and thick sheet metal materials can be processed when the pallet is placed on the processing table.